After initial distrust of India owing to Nehru’s camaraderie with his former colonial oppressors, Moscow drew closer to New Delhi because of its leadership position in the emerging world. However, the British were cunning. Realising that a violent rebellion by India’s armed forces and revolutionaries was coming, and knowing Gandhi couldn't save them this time, the British agreed to retreat from India, dumping all credit on Gandhi and his non-violence. The British retreat sort of legitimised the theory of non-violence, and Nehru’s policies found takers in many developing countries. 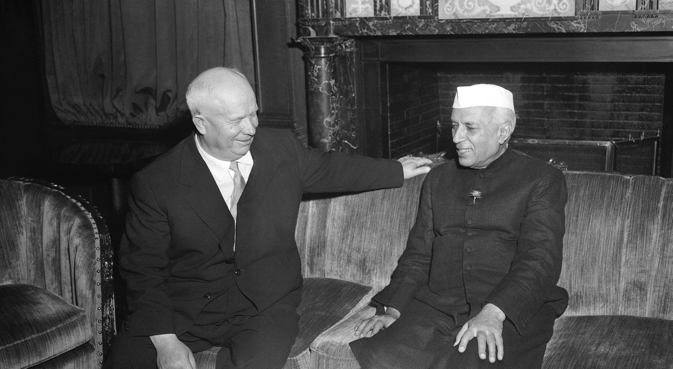 “At that point, whether we wanted to or not, we had to listen more closely to what the leaders of the Indian people were saying,” writes Khrushchev. Russian leaders also distrusted Nehru because he was palling around with the British, the same people who had murdered no less than 80 million Indians through artificial famines and wars. “We couldn’t understand why he took such a patient and tolerant attitude toward the British, who had formerly enslaved his country. British officers continued to serve in the Indian army, and British officials still held posts here and there in India. That put us on our guard,” Khrushchev writes. On the positive side, even as leaders like Nehru were seen by the Russians – as well as the Chinese – as working in cahoots with the British, they were sympathetic towards Indians. “Unquestionably the Indian people enjoyed special respect in the USSR because they had formerly been oppressed by the colonialists and had now achieved their liberation,” the Russian strongman writes. Clearly, Khrushchev knew economics better than the lotus eating Nehru.